Summer has finally arrived–with the heat, thunderstorms, and all. Thank goodness! These pictures are a little late, they were taken two weeks ago. Unfortunately, I had two wisdom teeth removed, and it’s knocked me out pretty thoroughly. I took these the day before the surgery, and haven’t been at the computer since. To say my broccoli is huge would be an understatement. They almost took up 4 squares each. The good news about that–I had THREE harvests of broccoli before it got too warm. I had read about harvesting the main head, fertilizing and getting side shoots, but this is the first year I’ve experienced it! I seriously got as much broccoli from my second and third cuttings as I did from the initial heads I harvested. And, my peas doubled in height since last month, and have since been producing delicious, crisp pods. YUM! I keep harvesting my parsley to keep it growing well, though it is infested with aphids. I have yet to tackle that problem. Here are onions, two more broccoli plants, and even more onions. 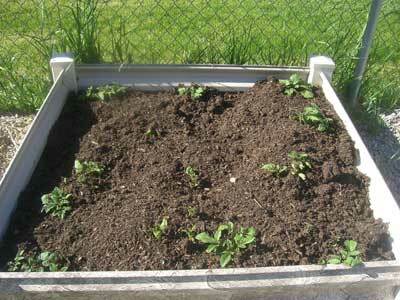 I planted cucumbers and a cherry tomato on the left, but they are too small to see in this picture. 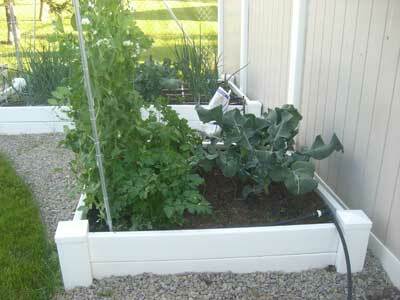 I also planted beets on the front-right, and Swiss chard in the back. As it grew I kept wondering what it was, and I had to go back to my garden plan to figure it out (this is my first year growing chard). Here are my potatoes. 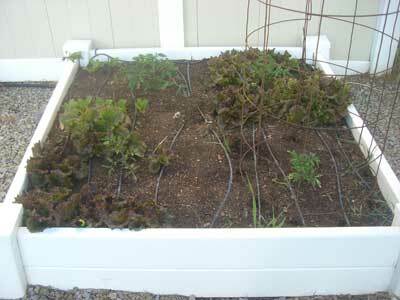 You can see that the garden was not yet full–as the plants grew I kept filling and covering them up with soil. Now the soil is to the top, and they’re getting tall. The big plants you see are spinach, and I harvest it nearly every other day. Remember, the more you harvest, the more it grows! 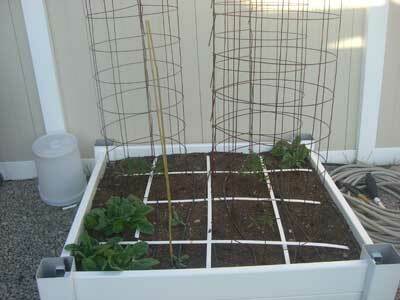 The tomato cages look pretty optimistic, since the plants are just tiny in this picture. I’m keeping my fingers crossed that I’ll get any tomatoes at all! 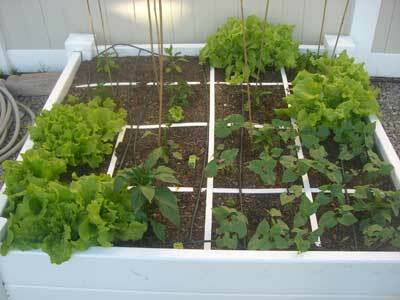 The happy plants are lettuce and green beans. The spindly sad plants are peppers. I hope it makes everyone feel better to see some of my utter failures. I’m seriously going to the store to buy more pepper plants in the slight chance that I might harvest some of my own and not have to buy them to make salsa. Here are three more tomato plants, but I only caged one of them. The other two are surrounded by lettuce and chard–I should have put the cages in sooner, because now I don’t have the heart to crush them. I know it won’t be long before the lettuce is harvested, and I’m thinking of transplanting the chard, since it should produce all summer. So there is my garden in the middle of June. 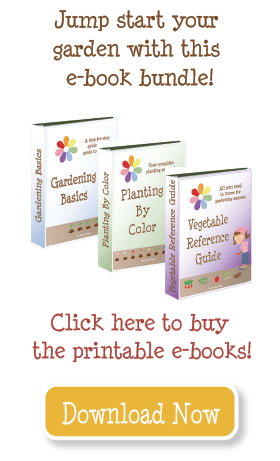 All the hardy and semi-hardy veggies are thriving, and my tender veggies are struggling. Now the heat has kicked in, I expect the tide to turn, and I’ve already seen a lot of growth. Isn’t it just like life, though? I mean, we can’t control the weather, but every season and situation comes with its advantages and disadvantages. I may be short on salsa, but my family has feasted on broccoli, lettuce, spinach, and peas. Some years we barely have a spring, and then are overrun with tomatoes. So it goes! The strike is over. 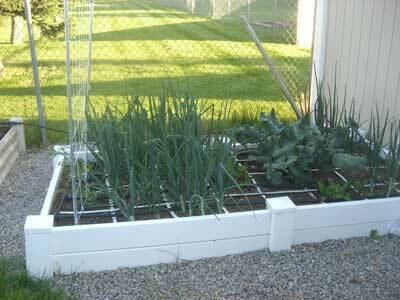 . .
It’s the most effective way to allow plants to grow from both sides. Hi, It looks like you put your trellis in the middle of your sq., r u suppose to do that?Do u plant your peas on both sides of your trellis? I had a similar issue. Mine did not seem to be thriving, but they have since started flourishing. I’m in central Utah, and my tomatoes are thriving suprisingly. My daughter counted 15 little green tomatoes. I have baby bell peppers too, but the broccoli…well it shriveled. My potatoes aren’t very happy either. I guess you just never know. Your garden looks great though. I love your site! Nice looking garden! I’m in Utah too, and my pepper plants haven’t done a thing, either. My potatoes are incredibly lush and seem to grow several inches daily. My lettuce looks just like that, too. It was labeled “iceberg” so I’m not sure if I’m supposed to wait for it to grow a little head or just eat the leaves. You’re inspiring me to give broccoli a try next year. My peppers look remarkably like yours. Each yellowing leaf finally fell off. I was sure they weren’t going to make it – and I couldn’t figure out was it the heat or lack of heat or the watering. But all of a sudden, I have a new flush of little leaves on the bottoms of the pepper plants. It’s like they are restarting themselves. So, you may not have to rebuy.